Perera, A. T. D., Wickramasinghe, P. U., Vahid M. Nik & Scartezzini, J. L., 2019, In : Applied Energy. 243, p. 191-205 15 p.
Melin, C. B., Hagentoft, C. E., Holl, K., Vahid M. Nik & Kilian, R., 2018 Oct 15, In : Geosciences (Switzerland). 8, 10, 378. Gou, S., Vahid M. Nik, Scartezzini, J. L., Zhao, Q. & Li, Z., 2018 Jun 15, In : Energy and Buildings. 169, p. 484-506 23 p.
Mauree, D., Coccolo, S., Perera, A. T. D., Vahid Nik, Scartezzini, J. L. & Naboni, E., 2018 Apr 10, In : Sustainability (Switzerland). 10, 4, 1134. Kavan Javanroodi, Mahdavinejad, M. & Vahid Nik, 2018, In : Applied Energy. 231, p. 714-746 33 p.
Vahid M. Nik, 2017 Nov 1, In : Energy and Buildings. 154, p. 30-45 16 p.
Perera, A. T. D., Vahid M. Nik, Mauree, D. & Scartezzini, J-L., 2017 Sep 1, In : Energy. 134, p. 103-120 18 p.
Perera, A. T. D., Vahid M. Nik, Mauree, D. & Scartezzini, J-L., 2017 Mar 15, In : Applied Energy. 190, p. 232-248 17 p.
Perera, A. T. D., Wickramasinghe, U., Vahid M. Nik & Scartezzini, J-L., 2017, In : Energy Procedia. 122, p. 187-192 6 p.
Vahid M. Nik & Jesper Arfvidsson, 2017, In : Energy Procedia. 132, p. 616-621 6 p.
Vahid M. Nik, 2016 Sep 1, In : Applied Energy. 177, p. 204-226 23 p.
Vahid M. Nik, Mata, E., Sasic Kalagasidis, A. & Scartezzini, J. L., 2016 Jun 1, In : Energy and Buildings. 121, p. 176-187 12 p.
Vahid M. Nik, Mata, E. & Kalagasidis, A. S., 2015 Nov 1, In : Energy Procedia. 78, p. 955-960 6 p.
Chaussinand, A., Scartezzini, J-L. & Vahid Nik, 2015 Nov 1, In : Energy Procedia. 78, p. 297-302 6 p.
Perera, A. T. D., Vahid M. Nik, Mauree, D. & Scartezzini, J-L., 2015, p. 505-510. 6 p.
V. M. Nik, Svensson, Å. & Lindh, P., 2015, Lund, Sweden: Lund University. Vahid M. Nik & Adl-Zarrabi, B., 2014, p. 517-524. 8 p.
Vahid M. Nik & Sasic Kalagasidis, A., 2014. Vahid M. Nik & Sasic Kalagasidis, A., 2013 Feb, In : Building and Environment. 60, p. 291-304 14 p.
Vahid M. Nik, Sasic Kalagasidis, A. & De Wilde, P., 2013. Vahid M. Nik, Sasic Kalagasidis, A. & Kjellström, E., 2012 Sep, In : Building and Environment. 55, p. 96-109 14 p.
Vahid M. Nik, Sasic Kalagasidis, A. & Kjellström, E., 2012 Jul, In : Building and Environment. 53, p. 107-118 12 p.
Vahid M. Nik, 2012 May. Vahid M. Nik, 2012, Gothenburg, Sweden: Chalmers University of Technology. 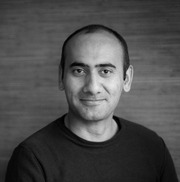 1 p.
Vahid M. Nik, 2011 Jun. Vahid M. Nik, 2010, Sweden: Chalmers University of Technology. Vahid Nik & Sasic, A., 2010, p. 149-157. 9 p.
Vahid Nik & Sasic Kalagasidis, A., 2010, p. 393-401. 9 p.
Vahid M. Nik & Sasic Kalagasidis, A., 2008. Vahid M. Nik & Nielsen, A., 2008. Rahimi, A. B. & V. M. Nik, 2007, In : IIE Transactions (Institute of Industrial Engineers). 20, 1, p. 67-82 16 p.
Vahid M. Nik, 2007, Chalmers University of Technology. Rahimi, A. B. & V. M. Nik, 2006.